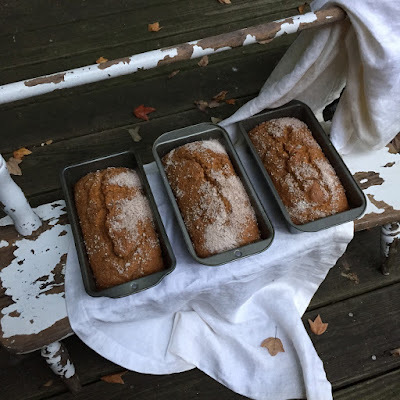 When the leaves start falling I pull out my favorite recipe for pumpkin bread, baked in my Mother's loaf pans. I love to bake three at a time because that means there's enough to share, just like my Mom used to bake her bread in 20-loaf batches so that on bread-baking day she could place a warm loaf into the hands of passers-by, or a relative who was ailing, or an Amish neighbor who stopped by to use the telephone. Then she would bag them up, tie them with little twisties and bring a tray of them to my house across the street from hers. And they would go in a neat little row in my freezer to supply us until the next bread-baking day. 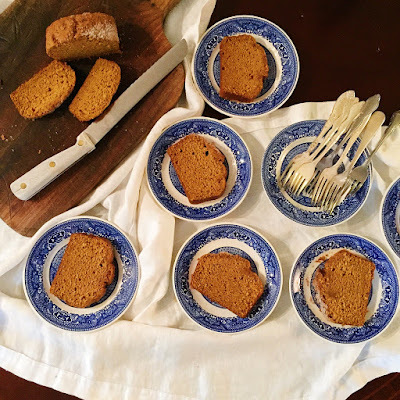 In a small bowl, stir together 1 tablespoon flour, 3 tablespoons brown sugar and 1 teaspoon cinnamon. Sprinkle over loaves before baking. Beat eggs slightly. Add sugar, oil and water, then add add dry ingredients and mix well. Pour into three medium size loaf pans or two large loaf pans. Bake at 350 degrees for 50 minutes or until knife inserted in center of pan comes out clean.